I feel strongly about grammar, but I have a feeling you all do, too, so go ahead and vent in the comments. I own Bryson’s Troublesome Words, Ian Mayes’ Only Correct, Manser’s The Secret Life of The English language and a second-hand copy of Fowler’s Modern English Usage. I still don’t know how to use some punctuation. I did English in my degree. My second language and almost third language grammar is better. Because they have actual sensible rules. English is a really fluid language, Sure Thing, and that includes conventions on punctuation. I speak from nearly forty years experience of copy-editing: loads of things that were unacceptable to publishers when I started are completely accepted now – and I’d be in the wrong if I queried them. I hate that. That damn disappearing comma, for one thing. Alright is not all right. I could go on. OTOH, the fact that English is flexible enough to let me use OTOH, I like. That made me so happy. Thank you for the link. I have an alot in my queue in Ravelry! I’d still correct ‘alright’: all is not yet lost. And I do enjoy the way people play with English and reinvent it – most of the time. Lol. That famous Usenet comment about the impurity of the English language comes to mind. Something about English chasing other languages into dark alleys and attacking them to riffle their pockets for spare vocab and grammar. Love this. And it’s so true. The language just cruises conversations in all languages and then picks their pockets. I had to look it up. Epigram by James Davis Nicoll. With grammar, I also have trouble with the finer details of tenses. I couldn’t identify plu-perfect or whatever transitive if I was asked in a game show. Luckily I never enter game shows. I know the simple tenses like the pluperfect, but there are a ridiculous number of tenses in English, which I’m happy to have mastered unconsciously rather than knowing what names grammarians have given them. Some examples of why the Oxford comma is generally a good idea. I believe passionately in the Oxford comma. THIS is why I always use the Oxford comma. Drives me crazy to see a sentence that ignores it. A friend sent me a picture of a new café near him. It’s called Barristers’ Coffee, and it was the most upsetting thing to happen to my brain all week. Are the owners all lawyers? In which case: IT’S A TRAP! I know – it’s the dissonance and not knowing that makes my head sputter. I love Ben Aaronovitch’s Rivers of London series, and I can accept that the narrator uses the “Me and Leslie did something” construction, give the character’s age and culture, and I totally bought into the way that construction drives the narrator’s boss (a guy born in the early 1900s to an upper-class family in England) crazy. Then, in a scene where the narrator is making a point of trying to speak formally for his boss, he says something like, “And that was when the problems started for Leslie and I.” With an aside that he used the “I” to make his boss happy. Except, of course, it’s wrong. I still haven’t figured out if the author intended it to be wrong, and that was the point, or if the author didn’t know it was wrong. I know, that made me crazy, too. And I like that book. Alot. I would have thought he knows what he’s doing, and is having his character use what used to be thought of as the correct form – from the false idea that Latin was the original, and perfect, language, and that in Latin the verb ‘to be’ takes the nominative case. In English this becomes ‘It is I’, rather than the correct (Germanic) ‘It’s me’. Peter, the protagonist, would know this as the old-fashioned construction that (presumably) his mentor thinks is correct. I’m pretty sure “I” in that construction is correct English as a predicate nominative. As in, it’s in my grammar books that way. My ancient English teacher (we were a big class so they hired people out of retirement) said if you reversed the subject and the object and it still sounded okay it was correct: It is I. I am it. Sounds good. It is me. Me is it. No. It would be in your grammar books, I daresay. It was considered correct for a long time, and still is by some. It came into fashion from about the seventeenth century, when grammarians turned their attention to English (from Latin), and thought that English grammar had deteriorated from its correct Latin roots (which of course it doesn’t have). Of course, since it was believed to be correct for a couple of hundred years, you could certainly argue that it is correct: English usage being just that. But it always sounded a bit off to me, and once I’d learned the history of it, as a student, it just sounded wrong. That’s the problem in a nutshell: It’s trying to codify a rebel language. It isn’t just that the language has changed over the centuries, any language does that to some degree. It’s that it changes over the weekend, which is one of the reasons it’s such a vibrant form of expression. We coin words as in groups and those pass into the general language, we invent words in reaction to events and those pass into the language, we decide words are archaic and let them drop. And American English is probably worse because we have traditionally been a melting pot (and will be again, regardless of that whack job in office right now) so we swipe from every language that drops by. I actually like that about English. I don’t know why I’m such a hardass about grammar. Maybe because there has to be some organizing principle or we just end up with chaos. Which is pretty much a description of English as a language, at least as far as vocab goes. Absolutely. And I think American English has been warped/reinvented by having such huge numbers of immigrants speaking it as a second language, and introducing forms of grammar from their first language. Then, of course, given America’s economic and therefore cultural dominance, these influence other Englishes, like English English. And there’ll be more radical warping as it develops as an international language, for the same reason: so many speakers for whom it’s not their native language. Makes it exciting and alive, if upsetting at times for older native speakers like us. Pretty sure Aaronovitch did it deliberately. There are places where he slips up and has Grant says “Nightingale and I” …. Let me tell you that a lot (see, I can do it!) of Germans make grammar mistakes that are based on English because in some cases, the rules are different, particularly concerning the punctuation. I used to think that by reading lots of stuff, you would automatically remember the correct way of spelling but it seems that I am part of a minority group here. But I’m still surprised to read mistakes that native speakers of English make which seem so logical to me like the difference between “their” and “there” or “its” and “it’s”. I guess the topic is universal. I catch it’s and its all the time even though I know the difference; I think it’s just easy to screw up the apostrophe. But there and their and they’re, and then and than make me nuts. But what REALLY sends me up the wall is used “less” for thing that can be numbered. “He had less doughnuts.” No, he had fewer doughnuts, he had less jam. That one just makes me crazy. My mom switches brake for break. I’ve stopped correcting her. I had the perfect tagline for Fast Women: “They don’t break for anyone.” SMP kiboshed it because they thought people would think it was misspelled. I still think it’s perfect. That is the tagline on my copy! I thought it was excellent. Oh. Maybe I won that argument and didn’t realize it. Eats, Shoots and Leaves is excellent, it is by Lynne Truss. Modifiers before “unique.” “Less” for “fewer.” Adjectives modifying verbs. OTOH, I feel I stultify daily. AHA. Another “less” for “fewer” nut job. I salute you. And yes “most unique.” Uniquer, even. Don’t get me started on “bigly.” Actually, I’m starting to feel sort of affectionate for “bigly.” It’s like a stray dog who had a very bad previous owner and really just wants to be loved. New to me. Can’t quite think when you’d use it. UGH! First time, closed the tab and lost it. Second time, request timed out and lost it. Maybe the universe doesn’t want JaneB to know this. http://www.businessinsider.com/trump-big-league-or-bigly-2016-10 with link to a NY Times article, if you want to play paywall lottery (sometimes they link for free, sometimes they don’t). OK, copy and then try to send this, where it will languish in purgatory until Jenny fishes it out because it has two links. It’s a Trumpism. It’s being used in sarcasm now to make fun of him, but I have this feeling that it’s going to stick. The use of who and whom. My husband has a friend who writes things like “the family whom bought the house” although he does not use whom inappropriately in speaking. But in writing, he uses whom every time who or whom is called for. It drives me crazy but he is a great guy who is self-conscious about his grammar since his siblings are all over educated. He has been doing this for 60 years so I keep my mouth shut. For some reason, people think “whom” is the educated version of “who.” Subjective and objective, people. Off topic, but: Galavant soundtrack! Oh, yay! I’d bought the version on iTunes only to find out it didn’t have “Secret Mission” on it. Not happy about that. Now I miss Galavant again. Not every scene was a winner, but every episode was. Who can forget the incredibly romantic “Put down that cat.” God, I loved that show. The loss of “affect” and “effect.” Since people can’t remember which one to use as a verb, they just go with “impact.” GRRRRR. I had a copy editor change that in a book once so that it was wrong. I threw the fit heard in Toronto. Don’t screw with my syntax. It’s only in the last ten years that ‘impact’ as a verb has become acceptable in British English. I’m still not keen. No, no, that is not a verb. I do something similar for choice, chose, choose. I use “opt” or a variation of it. This truly made me LOL. My dear mother used to correct perfect strangers about lie and lay…. but she looked like a sweet old lady, so they would just nod and back away. She also tutored in the local jail, and swore that as soon as she had taught a grammar or spelling rule, the next paragraph would contain something that broke the rule. Him and I……. when did that become a thing? People who used to use pronouns correctly started doing it incorrectly about 20 years ago. WHY?????? It makes me crazy, and I can feel myself becoming my mother. Irregardless is the one that gets me. I think it has been made officially valid now. Still, I know regardless is right. Regardless of that pet peeve, my grammar is awful. I write run on sentences with different tenses that I cannot name. I prefer algebra. Something is touching because I was emotionally touched by it. It is not NOT heart touching. I have a colleague who uses literally when she means actually. I haven’t told her. They’re already dismissive of my knowledge because I challenge their incorrect assumptions. I’m going to get the Oatmeal’s poster on literally and put it in our staff room. When I leave. Might put all the Oatmeal grammar ones. They rock. I believe in the Oxford comma rule, too. The other one that drives me nuts are when people change the part of speech of a word, for example – making a noun a verb. My two least favorite are healthful instead of healthy and we dialogued about that. Ugha! Make it stop! Somebody uses “dialogued” instead of “talked”? I threw a hissy fit when people started using wellness. Not only does it sound ugly but healthy is perfectly adequate. I saw ‘healthfulness’ the other day. On a creditable news site. Utilize instead of USE. It sounds fancier, I guess? But really all we want is to get kids in the library so they will use it. Use the resources we have arranged for them. Keep it open more hours so they can use it. That is annoying. A professor I once had spent part of a lecture giving us tips on writing papers for him, and one of things he covered was basically “choose clarity over sounding fancy.” The example was “use” over “utilize.” I always liked that about him. I do it myself but I wince every time I catch myself doing it. I try and tell myself that no one remembers it’s wrong now. I see that all the time. Argh. It sounded foreign to me when I first visited the States in 1968, so I was very aware of it coming into English. Ten years later, it was commonplace. I understood it was a German form, which appeared in American via German-speaking immigrants. I like it. Yes, in German there’s the adverb “hoffentlich” which can be used as well as “ich hoffe / I hope”. To be honest, I wasn’t aware of “hopefully” being wrong because it’s being used so often. In which context is it correct? “Hopefully” modifies the verb, so . . .
“I entered the contest hopefully” or “Hopefully, I entered the contest” just means I hope I win (I enter with hope). “Hopefully, he won’t bomb Massachusetts” usually means “With any luck, he won’t bomb Massachusetts,” snd is intended to mean “I hope he won’t bomb . . .” It clearly doesn’t say that, but that’s how people use it. What it says is that he will bomb Massachusetts with hope. Another big fan of the Oxford comma. And grammar in general. Somewhere around here I have a book called The Story of English that traces the language and its growth over time. Such a good read. That said, being raised in Montreal I didn’t get any real English schooling until grade four, and when English grammar was introduced I was lost. I got very upset and complained to my mom (an anglophone & teacher by training) who, bless her heart, went to a local book store and got some workbooks to help me learn. I took to it but then lost ground on my French grammar. Still, I’m grateful to have been exposed to two languages growing up. But I do think that culture plays a big part in our internalization of grammar. Even though I know the “proper” rules, I still say things like “close the lights” or “open the TV.” And when I write, my brain can see spellings of some words as both being correct like with “futur” or “future”–both correct spellings just different languages. As a writer, this is particularly fun when it comes to proofreading. Especially when I add in the US spelling vs Canadian spelling because I write in Canadian & Franglais with some French bits, but then I put out the final books in US spelling (but keep the Franglais & French bits). Where did orientate come from? It’s like someone decided that orient wasn’t a proper verb and decided to work backwards from orientation. It’s widely accepted but I hate it. Why isn’t being oriented good enough? Why must people be orientated? I view “orientate” as British, and “orient” as American. Maybe I made that up. I thought it was the other way round! ‘Of’ is the one that annoys me the most. I should of jumped higher. I shouldn’t of eaten that chocolate. I could of done better. It’s even worse than done without the have (e.g. I done it yesterday). It’s bad enough when it’s spoken, but in writing it’s just the pits. On the other hand, there’s Stephen Fry’s take on language. I’m not sure I agree, but I like that he’s disucssing it. Interesting. I don’t think I’ve seen “should of” in writing. I suspect that it’s evolved from the spoken “should have”, which is often pronounced “shud uhv”, which in turn is mistakenly transcribed as “should of”. Huh. I’ve read that the semi-colon is now considered too stuffy for modern fiction; use one at your peril. Basic punctuation has fallen out of vogue? Up next: Don’t use commas, question marks, or periods. They’ve become a little too full of themselves. I may or may not be guilty of abusing some punctuation marks, but for the love of God save the semi-colon from extinction. Don’t worry; the homeless semicolons can live with me. I think the only place I’ve been told not to use a semi-colon is in dialogue. Which kind of makes sense. Apparently, semi-colons shouldn’t appear anywhere in a novel. Not in dialogue, not in exposition. That a debate even existed came as news to me. I’m guessing the popularity of close/deep POV (which eliminates “filters” such as thought, felt, saw…) is responsible for this crime against the English language. If the MC doesn’t “think” in semi-colons, don’t use one. I’m calling BS, but most of these new rules strike me funny. I’d be all for a moratorium on ! abuse, but that’s another subject! Oy. They will take semi-colons from my novels when they pry them from my cold, dead hands. In the hypercorrection of “Me and him are going to the store” to “He and I…,” little old “me” became demonized. We are advised to use “and” instead. However, this had become adopted and ingrained to the point of ridiculousness in a woman I met recently. She would say, “It’s important to protect the client’s anonymity, and you are required by law to report x, y, and z.” What? Or, in response to “What did you do this weekend?,” she would say, “We decided to go for a hike, and it was raining.” So did you go or not? On the other hand, however indignant we may get, there are always more rules or nuances. We each draw our own line. I thought I was a stickler, but I worked for an old-school gentleman who had very precise ideas about word use (as should we all). For example, he objected to the use of “allow” in cases in which permission was not being granted: “This new software allows you to create your own game.” He insisted on “enable” instead. That makes perfect sense, and once I heard it, I could never unhear it again, but it had certainly never bothered me before. Somehow that booked just felt “dry” to me. I might as well have read a grammar text book. Say, I’m very late to the Saturday, but just in case there are any Bujold/Crusie crossover fans who are also subscribers to this post, there’s a new Penric novella out. Mira’s Last Dance. It’s an episode in a romance, not the whole thing, but the arc winds up nicely, even though the romance is an on-going question mark. I wrote about it over on Eight Ladies Writing, amongst other romance-y problems I am wrestling with. Link to Eight Ladies, please. I have so many grammar peeves I wouldn’t know where to start, but all the ones listed in the above comments apply. 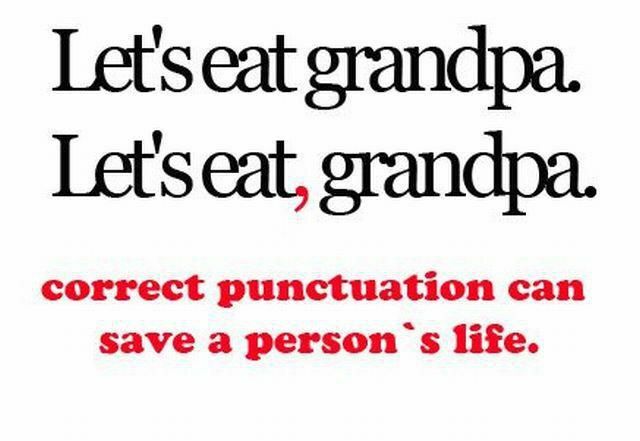 And don’t get started on comma splices. I’m an expert on the use of semicolons. I love a semicolon, when it’s used correctly. As you can see, however, I also love starting sentences with ‘and.’ I’m A REBEL. Apart from misplaced commas, my pet peeve is the interchangeable use of ‘disinterested’ and ‘uninterested’. They are two words, with different shades of meaning! Nero Wolfe would buy a dictionary that listed democrat as a verb simply to pull the pages out and burn them, but I was entertained. My favorite part is that her facts hurt his feelings. I love that. This has been such an entertaining post to follow. I want to thank all who have contributed their peeves and observations. With so much disheartening, negative, mean spirited dreck floating around the internet and on TV, I really appreciate all of the smart, funny comments found here. It’s like a cleansing of the mind. The Oxford Comma, it can mean big money!